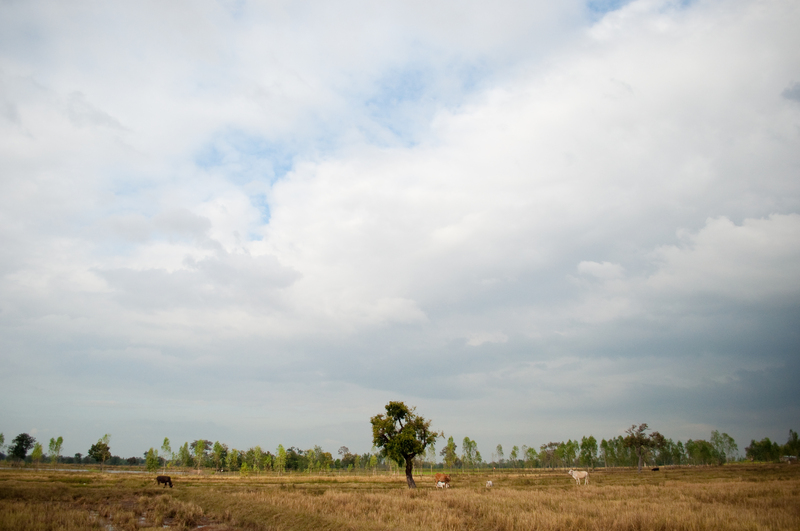 As much as I love our activities in Bangkok, the biggest area on my heart here in Thailand is the vast expanse of rice fields that make up Thailand’s rural Isaan region — a region known for it’s extreme poverty and as “home” to the vast majority of the women we meet and serve in Bangkok. My biggest hope here is to somehow grasp the root factors leading to the migration of women from the rice fields to the red light districts and, God-willing, invest in some areas that will help break the cycle on a holistic and sustainable basis. I had to chew on that one for a while, I admit. The alternative to entering a situation with a god-complex (or the attitude that I’m less poor and therefore have come to “help” people out of their helpless state) is entering a situation with humility and the primary objective to learn. Rather than documenting the number of ways that they could or should be better off (read: more like us), it’s seeking their unique value and worth. So, I spent the last several trips trying to rid myself of my western pride, attitudes and assumptions by simply being a part of the community and not really trying to change, or do, anything. I hoped simply to build relationships. As a result, I was able to see that there are many people in Buriram far less poor than I am in many ways and I have a great deal to learn from them. One thing working against me… Many in the region are used to white people coming in and throwing down money to “fix things.” Sadly, many of the nicer things in the area came as a result of an influx of foreign money, often through a foreign husband. Sometimes those foreign husbands are still around, some visit every few years, but most are out of the picture. I could write another blog post on this, or perhaps a thesis (which I should be working on right now instead of blogging, by the way…) but I’ll refrain for now. I’ll simply observe that the allure of foreign wealth is a significant contributing factor to young women migrating to the city — and to the red light districts — to find a husband. It leaves me with the uphill battle convincing the community that I’m different than the white people they’re used to; that I’m not a source of quick wealth. I just have to convince them I’m not a foreigner at all. Fast forward to now. My time just hanging out and being one of the family members has paid some dividends. When someone calls me a foreigner, the kids quickly and protectively shout back before I ever get the chance: “mai chai farang – khao bpen khon thai leeo”. She’s not a foreigner – she’s Thai! It’s a running joke now; I still stick out like a sore thumb, but those words bring me great joy. How did that happen? Pretty sure a gracious God had something to do with it. I think it’s starting to stick that, despite my white skin and my incessant questions, I’m just another Buriram sister, cousin, aunt or niece. In many ways, more country bumpkin than they are. Thankful for the chance to be welcomed into their community and looking forward to what this next season has in store. I think this is my favorite post so far! IMHO, humility is way too scarce in our western world! I’ve seen a similar level of respect (in a much, much smaller way) from the friends I’ve met in Ukraine by learning some of their language and just getting to know how they live instead of coming in for a few days with the all too common American attitude. Maybe it is just me but, while Jesus teaches us a lot of different things in the Bible, it seems like the most common theme that he always comes back to when asked what is most important is the neighbor thing – yes, stop and help the lowly Samaritan dude. You go girl! Keep being a Thai neighbor!